The snow has stopped at 12:09 pm after falling all morning. I woke at 8:30 am, happy to have had the sense of being in a cocoon of bedness, the dark and closed box of my room muffled by the soft outdoors. It was lovely, first to have slept so deeply and late, and second to come into the bright living room and open all the blinds to the white world, full of falling flakes of snow. And then several couples and kids came out early to sled down the hill outside my windows with whoops and screams. One father particularly touched me as he took his daughter, about 4, in a pink coat, farther up the hill, trudging up closer to the mailboxes, to try the run again and I tried to imagine what Lucy may be doing at the same moment. The landing spot for the brave, after the two curves of the road, was about 4 parking spots below the clubhouse, just across from my unit. The outward force flung some sliders outward which got them stuck on the near side. They all tried several times to get the perfect ride. 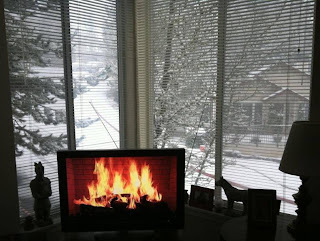 I sat computing on the couch, but had to jump up to the window whenever I heard a scraping of snow or a shout. That they were turning the slope into a sliding hell for my car mattered not a whit for the moment. The view was good and I loved watching the fun, warm and foot-stable inside. Flakes falling, childlike excitement, parental sharing of experience, the clear, crisp air, the pleasure of a warm home, what a wonder is Nature! Sad after-note: a huge pickup with a plow mounted on his bumper came. He made several passes around the curves down the hill, shoving the snow aside, and the sliding was over for the kids. Luckily from one angle, the father with the pink jacketed little one had just returned with heavier coats to climb slowly up the hill and slide on their plastic orb from the mailboxes all the way down, twisting and whirling around beautifully. Moments later, down came the truck, chasing the sliders home. From a recently retired Grandmother viewpoint, that was very sad.